There are a range of opportunities and challenges for the residents of Lagos. 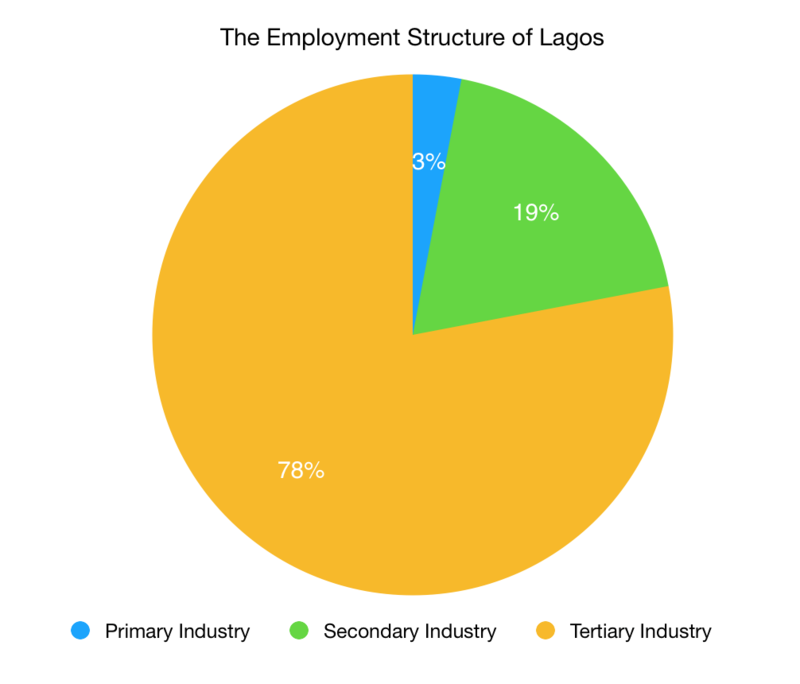 What are the advantages of Lagos’ location for industry? The coastal location of Lagos has been key in its development as a megacity. Since the settlement was established as a fishing village its geography has enabled it to become a thriving seaport. Lagos Lagoon provides a sheltered harbour for ships which makes it very accessible. Originally known as Lagos Airport, Murtala Muhammed International Airport has also increased the accessibility of Lagos. It is now the main arrival point for 80% of flights to West Africa. It is also the main base for Nigeria’s largest airline, Arik Air. In 2015 over 7 million passengers passed through the airport. Lagos has developed into a major industrial powerhouse as the result of its excellent transport links. Additionally, the growing population provides as workforce for goods and services along with a market for them. Also, with more schools and universities the workforce is becoming better skilled and educated. All of these factors combine to encourage industry to locate in Lagos. As a country develops a greater proportion of the workforce is employed in tertiary industry and few people work in the primary industry. The graph below shows rapid development in Nigeria between 2000 and 2016. However, when compared to Nigeria as a whole, Lagos makes a significant contribution to the development of the country. What contribution does Lagos make to the Nigerian economy? Lagos makes a significant contribution to the Nigerian economy. It contributes 30% to Nigeria’s GDP. This is remarkable considering Lagos is home to only 10% of the population of Nigeria. The majority of Nigeria’s manufacturing is based in Lagos as well as many service industries such as finance. Lagos is constructing a new city on the coast called Eco Atlantic. Eko Atlantic is an entire new coastal city being built on Victoria Island adjacent to Lagos, Nigeria. The project is privately funded by South Energyx Nigeria Limited – the developers and city planners, a subsidiary of the Nigeria-based Chagoury Group of companies – working in strategic partnership with the Lagos State Government and supported by the Federal Government of Nigeria. It will be home to a quarter of a million people and employ 150,000 more. The rate of unemployment in Lagos is lower than the rest of Nigeria. The rate was 9.9% in 2015. However, for those without a job there are no government benefits available. Most people who are not formally employed work in the informal economy to get by. This includes jobs such as shoe shining, waste recycling or street vending. The Olusosun landfill is a 100-acre dump in Lagos. It is the largest in Africa, and one of the largest in the world. The site receives up to 10,000 tons of rubbish each day. Waste from around 500 container ships is also delivered to the site, adding a substantial portion of electronic waste. Some of this material is treated with chemicals to extract reusable products resulting in toxic fumes being released. Olusosun landfill was once located on the outskirts of the populated area, however Lagos has, in recent years, undergone such massive expansion, that the site is now surrounded by commercial and residential areas. There are shops, restaurants, bars, cinemas and a mosque at the dump. Each day the residents sort 3,000 tonnes of waste by hand, picking out valuable items to sell. Without the dump, a lot of reusable items would go to waste. When it is dry natural gases build up under the waste. This often leads to fires which are hard to put out. Natural gases such as methane can be harnessed for energy. A new project by the Lagos State Waste Management Authority is planned to produce 25MW of electricity. This is enough to power a town, though not a city the size of Lagos. Olusosun is an example of the way people in Lagos find solutions to problems – seeing an opportunity where others might just see junk.